Marine Gen. Thomas Waldhauser speaks before the start of a hearing before the House Armed Services Committee on Capitol Hill in Washington, March 6, 2018, about "National Security Challenges and U.S. Military Activities in Africa." U.S. lawmakers are no closer to getting a look at the completed report on an ambush by an Islamic State-affiliated group that killed four U.S. special forces soldiers last October in Niger. 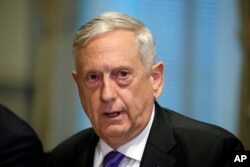 The Pentagon report and its recommendations are being reviewed by U.S. Defense Secretary Jim Mattis and Chairman of the Joint Chiefs of Staff General Joseph Dunford. Defense officials say they will also first brief family members of the soldiers who were killed before sharing the results with lawmakers. Defense Secretary Jim Mattis answers a question about the ambush of U.S. troops in Niger at the Pentagon, Oct. 19, 2017, in Washington. U.S. officials familiar with the report told the Associated Press that while the investigation into the ambush did not find a single point of failure, the 12-member Army Special Forces team never got approval from senior commanders to join Nigerien forces and go after a high-level IS militant (Doundou Chefou). As a result, the officials said the team was unable to adequately assess the risks associated with the mission. Four U.S. soldiers and four Nigerien troops were killed on Oct. 4 near the village of Tongo Tongo, about 200 kilometers (125 miles) north of the Nigerien capital Niamey, after they were attacked by as many as 100 heavily armed, IS-linked fighters. On Monday, Islamic State supporters posted a nine-minute long video of the ambush online. It shows three U.S. soldiers trying to fight off dozens of militants armed with machine guns and grenades. Part of the recording appears to be taken from the helmet camera of one of the fallen soldiers. At the end of the video, the helmet camera shows the soldier surrounded by militants as they open fire and kill him. “The release of these materials demonstrates the depravity of the enemy we are fighting,” the Pentagon said in a statement Monday. A combination photo of U.S. Army Special Forces Sergeant Jeremiah Johnson, from left, U.S. Special Forces Sgt. Bryan Black, U.S. Special Forces Sgt. Dustin Wright and U.S. Special Forces Sgt. La David Johnson killed in Niger, West Africa, Oct. 4, 2017. Army Sergeant La David Johnson and Staff Sergeants Bryan Black, Jeremiah Johnson and Dustin Wright were killed in the ambush. There are about 7,500 American troops and contractors in Africa, with about 800 in Niger. AFRICOM Commander Gen. Waldhauser told lawmakers Tuesday that U.S. soldiers serving in Niger should be receiving additional pay due to the dangerous situation on the ground. “We have made that request a while back,” Waldhauser said when asked about whether U.S. troops there were getting what is referred to as Imminent Danger Pay (IDP).